Mutual funds accounting is a critical matter for the financial system, given the increasing preference for mutual funds over direct holdings of securities such as stocks and bonds by the investing public. In particular, many, if not most, individual investors and retail clients have the majority of their savings in employer-sponsored 401(k) plans, which typically offer a selection of mutual funds as the investment choices. The end product of mutual funds accounting is the accurate pricing of these investment vehicles and the correct assignment of investment income to holders thereof. These are thus major concerns for the chief financial officers, controllers and operations managers of mutual fund companies. Calculating the value of its investment portfolio on a daily basis. See discussion of net asset value (NAV) below. Anticipating and recording all income, such as dividends and interest. Properly accruing interest on bonds and other similar fixed income securities held in the investment portfolio. Properly amortizing the discount or premium on bond purchases. See detailed explanation below. Recording all securities transactions, such as buys and sells of portfolio investments. Recording all realized capital gains, both short-term, and long-term, that result from securities transactions in the fund. Recording all inflows and outflows of funds due to purchases and redemptions of shares by investors. Maintaining records of the shares owned, and transactions made, by each shareholder in the fund. Tracking distributions of income and capital gains made to shareholders in the fund. In the best mutual funds accounting departments, these activities will be highly automated. However, some manual input, reviews, and adjustments still may be necessary. Often abbreviated NAV, it is the aggregate value of a mutual fund's investment portfolio divided by the number of its shares outstanding. The standard convention is to calculate NAV at the end of each trading day, based on the closing prices of all securities held therein. NAV also takes account of other activities listed above. Orders to purchase or sell shares of a mutual fund are executed at the closing NAV for the day if they are received before the market close. If not, they are executed at the closing NAV for the next trading day. When bonds are purchased at a discount or premium to their par value (that is, at a price lower or higher than the principal value that will be returned to the investor holding it when the bond matures), the difference between the purchase price and par value is recorded over time as an adjustment to the interest income generated by the bond. The interest income recognized on a bond bought at a discount will be higher than the actual interest payments received. On a bond bought at a premium, it will be lower. The net effect is that any discount or premium on the purchase of a bond held to maturity will not be recognized as a capital gain or loss, but rather as an adjustment to interest income. Bond amortization is calculated on a daily basis by mutual funds. It is also a prime example of the sorts of engagements that are encountered in the field of operations consulting. A leading custodian bank offered mutual funds accounting services to mutual fund companies that already utilized it for the safekeeping of securities. 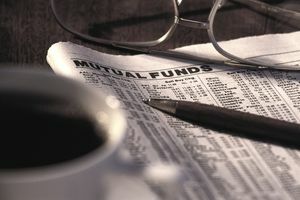 Mutual funds accounting, in this context, primarily was involved with the daily computation of net asset value (NAV). The bank and its mutual fund clients were dissatisfied with the timeliness and accuracy of the NAV calculations being done. The bank engaged a team of consultants from a Big Four public accounting firm to study the processes within the mutual funds accounting department and to recommend changes to improve it. The consulting team from the Big Four firm spent several days observing how the mutual funds accounting department worked, by shadowing its employees as they performed their daily tasks. The consultants also interviewed employees and their managers, to get a better understanding of how they viewed their responsibilities, as well as to assess how knowledgeable they were about the mutual funds accounting field. The consulting team developed detailed flowcharts of processes in the department and discussed these with management, pointing out where work processes could be improved. The consultants also suggested improved automation. After getting approval from bank management, the consultants searched for software vendors that had packages appropriate to the bank's situation. They then identified one that was willing to customize its existing system to meet the specifications needed for the bank's unique situation and its mix of clients. Next, the consultants drew up these specifications in detail, and conducted extensive testing of the software as each module was completed, to be sure that calculations were done properly, and the system was durable and reliable. The user acceptance testing phase took a number of months and required extreme attention to detail. When the system was finally completed to specifications, the consulting team oversaw its installation and implementation, and led the training of employees, remaining on-site until the bank was comfortable that the new procedures were working well. In all, the project lasted almost precisely one year, with a team of three consultants on-site at the bank daily.